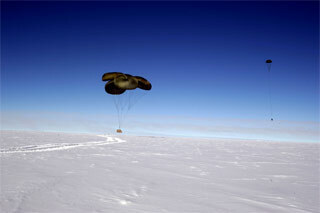 For the first time since July 1999 when medical supplies were airdropped to treat Jerri Nielsen, an airdrop was conducted at Pole on 20 December 2006. 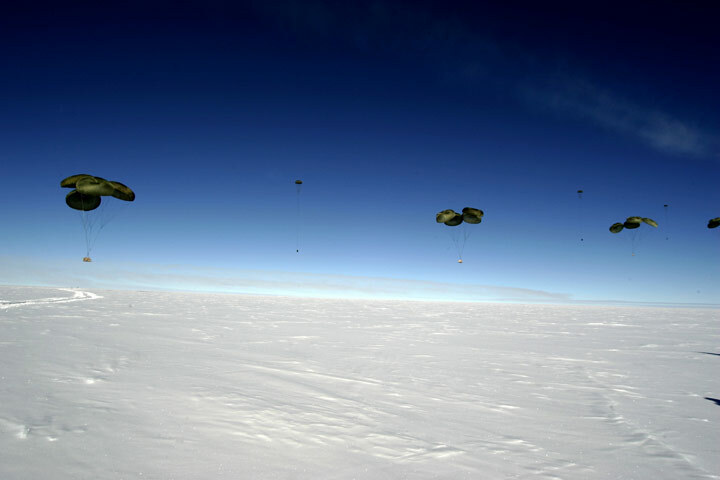 The flight left Christchurch just before noon, and after a refueling stop in McMurdo, the flight arrived in the skies over Pole around 2030. 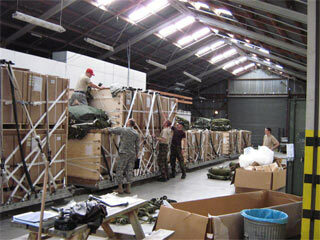 The drop consisted of 4 air pallets with triwalls of food, total weight was just under 70,000 pounds. These were dropped in a single pass from a height of about 1000 feet. 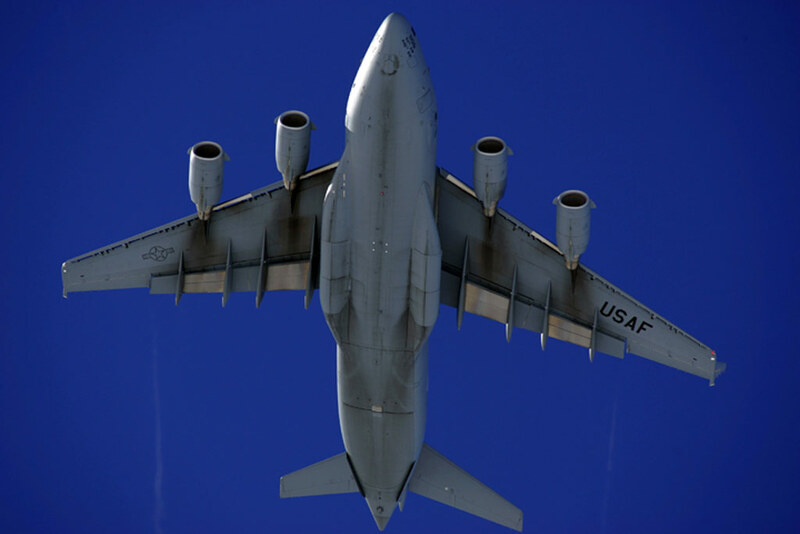 The operation was conducted by a 14-person crew, members of the Air Force Reserve's 446th Airlift Wing based at McChord Air Force Base in Washington state. 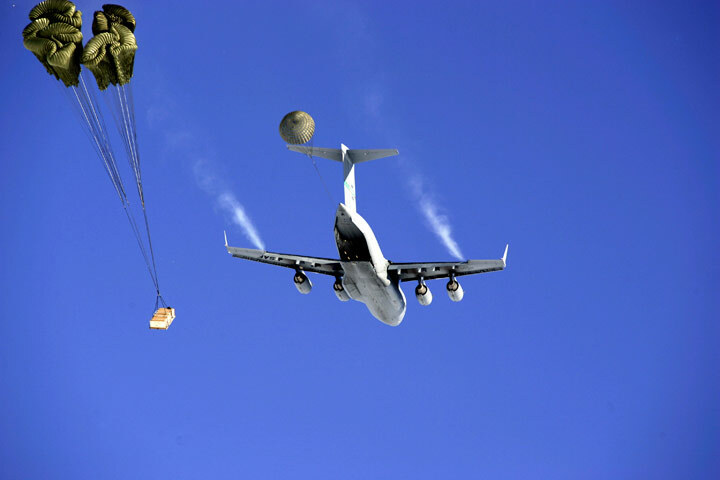 "The main goal of this summer's C-17 airdrop is proof of concept. Before, all airdrops in the C-141, LC130 and older aircraft at the pole were computed by the navigator. He would figure out a sight angle, he knew his ground speed and the ballistics of the cargo and chute. When the drop zone (DZ) crossed his sight angle (navigators had many techniques on sight angle, one was drawing a grease pencil line across the front windscreen) he would start a stop watch for a given number of seconds and would count down and call green light, the co-pilot would then release the load for the drop. 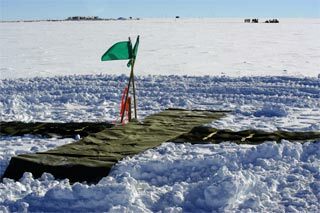 This is a very low tech delivery method , not very accurate but very reliable if you could see the DZ. The C-17 has done away with the navigator and flight engineer and replaced them with computers. These are far more accurate, and in normal conditions some what reliable. 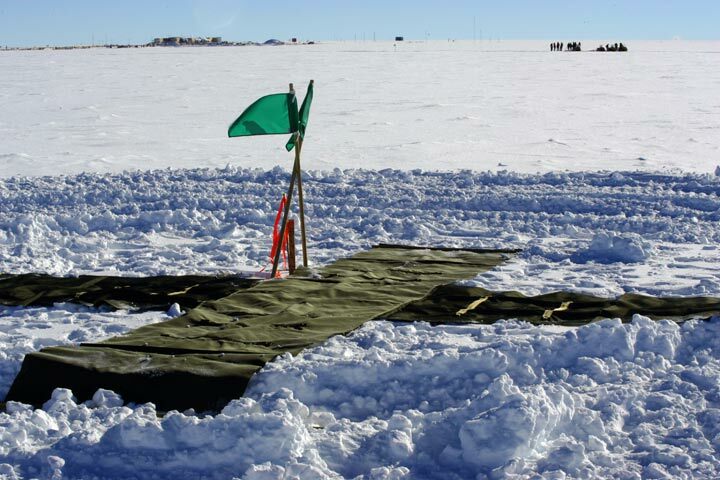 But as all of you know the South Pole is not a normal place and the Air Force and Boeing would like to know a drop will work near the pole when the plane is flying in grid mode. The pilots have run the profile in the simulator with mixed results and Boeing 'thinks it should work just fine'. Boeing has installed a special data collection computer on the C17; we will be using the data to help with any future software upgrade for polar operation which might be needed. "The type of delivery method we will use on this drop is called a heavy equipment drop. 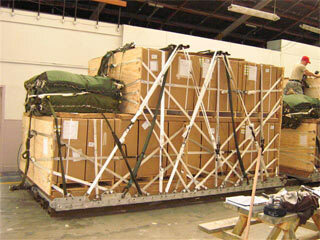 We will be dropping 4 ea-16 foot platforms weighing between 16,625-17,765 pounds for a total weight of 68,500 pounds. This type of system can drop road graders, fuel bladders or other large equipment that needs a softer landing. This system employs a drogue chute, then an extraction package that will pull the cargo out of the aircraft, then deploy the main chutes (1 to 8 main chutes depending on the weight). 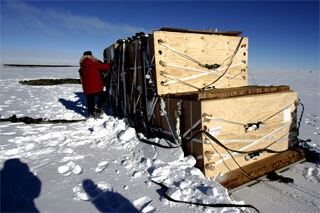 After the load lands, the main chutes will release so the cargo is not dragged by any wind. The type of drop we use to deliver food, fuel barrels or supplies that can hit the ground a little harder is called a container delivery system (CDS). This load, when released, will simply roll out the back and the chutes will deploy from a static line just like a paratrooper. "There are very few options for relief for the folks who winter over. We want to make sure airdrop is a viable and safe option before it's needed in an emergency." Here's the cargo being prepared in Christchurch. The food you see here is mostly baking items. ...a C-17 Globemaster III, same one used to ferry folks from ChCh to MacTown. 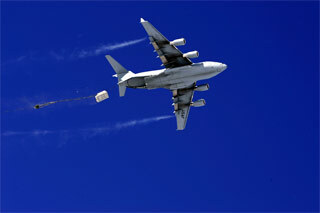 Note that the aircraft used to drop cargo to the original station in the 1955-61 era was the C-124 Globemaster. The aircraft first did a dry run, then circled back and made the drop approach about 10 minutes later. 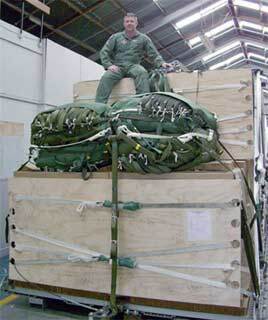 The ramp opened and a drogue chute appeared, this pulled the first pallet out. The others followed in quick succession. Afterward, the C-17 circled again and did a photo-op flyby down the skiway. Now the work begins...all the chutes and rigging have to be gathered up quickly and sent back up north. 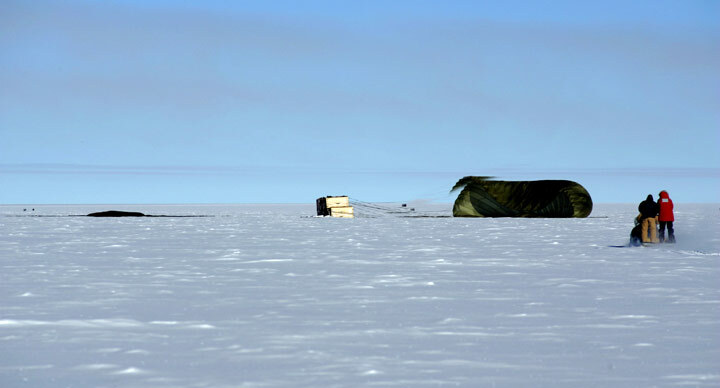 A crew of specialized riggers from the NZ Army came to assist with this. Here's more flour for the cargo folks to bring into the dome. 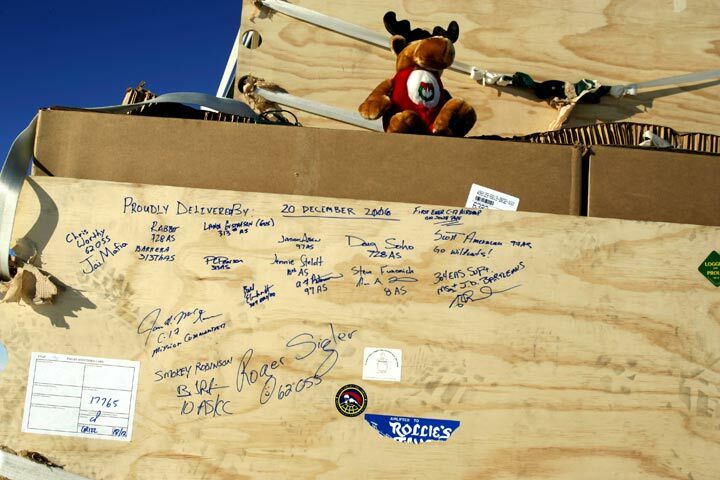 Well-wishes from the Air Force. But there's more...from the vantage point of the aircraft, here's a video of the drop from start to finish (southpoleairdrop.mpg) (6MB, broadband connection recommended). All of the Pole photos above were taken by Forest Banks, the Pole panorama is one of his favorites. 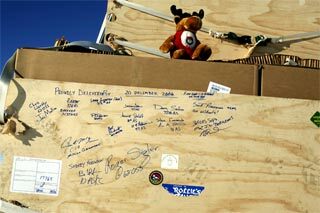 The Christchurch photos and video were provided to the station by the Air Force team. Thanks also to Liesl Shernthanner and Glenn Grant.